The transition from the current two-dimensional data storage and logic schemes to three-dimensional data structures could significantly improve the performance and capacity of electronic devices. Instead of simply storing and manipulating data in a two-dimensional array of elements, one can envisage stacking data bits on top of each other, thus greatly enhancing the data density. Magnetic tunnel junctions, where two magnetic metal layers are separated by an insulating barrier, are the cornerstone of many current and proposed spintronic device concepts such as MRAM, magnetic sensors and spin logic devices. The data in such devices is encoded in the magnetization direction of the metal layers, which are currently limited to two layers per device. But what happens if we stack several such magnetic tunnel junctions on top of each other? Nine such magnetic tunnel junctions, composed of alternating layers of Fe and MgO stacked on top of each other, have been grown epitaxially on a single-crystal MgO substrate. 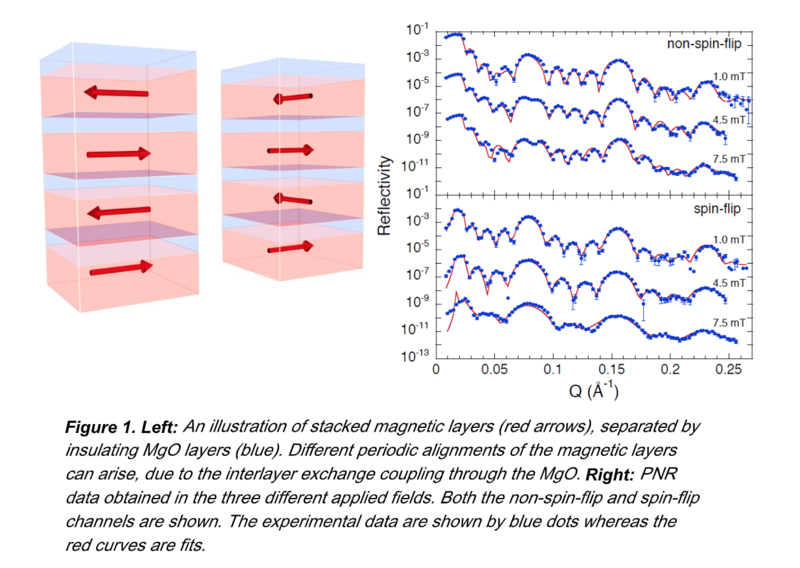 The magnetic interlayer exchange coupling between the Fe layers results in a periodic alignment of the magnetization of the layers (see Figure 1) and a sequential switching of the magnetization direction in an applied magnetic field. Furthermore, the coupling between the layers can be tuned by changing the thickness of the MgO layers, allowing the magnetic configuration to the manipulated. Polarized neutron reflectivity has been the key to determining the alignment of the magnetic layers as it probes the depth dependent magnetization, yielding both its size and direction in each layer. These results have been published recently in the scientific journals Physical Review Applied and Physical Review B. These results open up the possibility of new types of memory or logic devices where data is stored as magnetic bits in a three-dimensional layered structure and can be written in or read out by purely electrical means. Before this can be achieved, the transport properties of such stacked junctions must be studied as well as the effects of nanopatterning. The project is led by Professor Björgvin Hjörvarsson at the Department of Physics and Astronomy at Uppsala University, in collaboration with Dr. Fridrik Magnus at the University of Iceland and Dr. Per Persson at Linköping University. The Super ADAM beamline at the Institute Laue-Langevin has been instrumental in providing an understanding of the magnetic configuration in these layered structures. The work was funded by the Swedish Research Council (VR) and the Knut and Alice Wallenberg foundation (KAW). The work of FM is funded by the Icelandic Centre for Research.